Anyone else want to inform Taylor Swift that Ireland is not part of the UK? Dear Taylor Swift: No. Just no. After a certain point, and after decades and decades and decades of correcting everyone who makes this mistake, you'd think that people would just eventually get it right, or else they're wilfully trying to get it wrong. And here we are... are you ready for it? 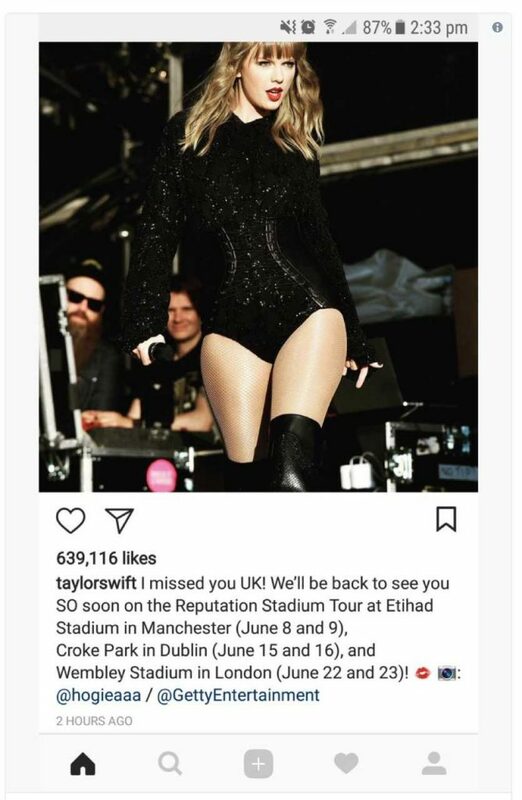 Taylor Swift sent this in the hours following her gig in Swansea, which is very much in the UK, but the addition of Dublin in her "UK tour" is the kind of thing that is liable to set off Irish fans; and not in a good way. What we need to do is nominate one really famous person to do some kind of PSA, to inform all of the celebrities in the world that Dublin and the rest of the Republic of Ireland isn't actually in the UK? Beyoncé, maybe? Donald Glover is pretty hot right now, maybe he could inform the masses? Whoever it is, just keep the message simple: from now on, just say "the UK and Ireland". Two extra words, and everyone is happy. Problem solved. Taylor Swift has since updated the post to say UK & Ireland. The power of JOE is real.